nTopology Platform (nTop) is an engineering environment for design, simulation, & advanced manufacturing processes. It is the only design solution that allows engineers to simultaneously consider function, geometry, and manufacturing within a computational framework. nTop’s breakthrough computational engineering environment seamlessly combines design, simulation, and manufacturing considerations in an integrated environment. Changing model properties or geometric forms will simultaneously update subsequent steps and end results. Coupling these functions saves time by reducing data transfer delays as well as reducing geometry bottlenecks common with iterative design and engineering changes. The implicit modeling technology provides a data framework in nTop that rapidly produces a lightweight representation of any geometry, regardless of complexity. With zero modeling and rebuild errors, you can remove traditional CAD failures as a bottleneck to design workflows. 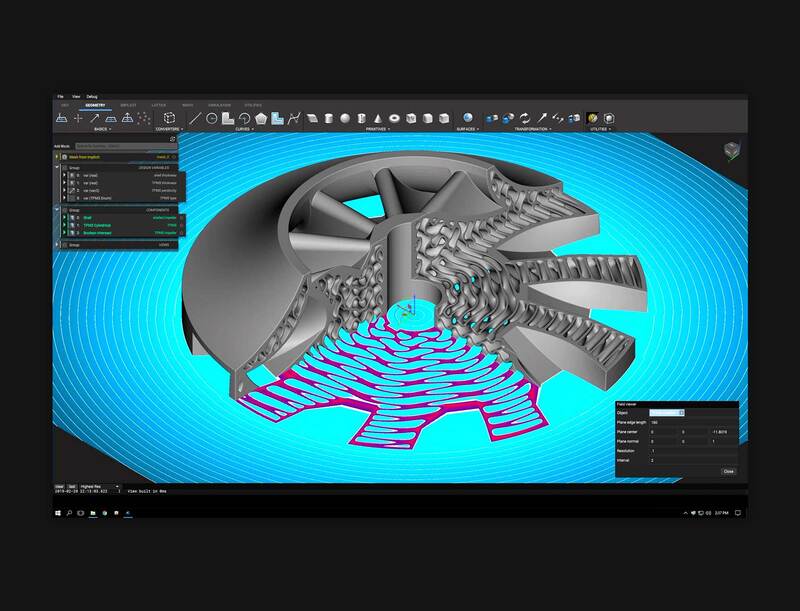 nTop saves valuable design time by eliminating the need for translation to inefficient mesh-based geometry and directly outputting to various additive manufacturing formats. No more STL files! Direct connections through machine slice files to close the design loop, maintains model integrity, and allows toolpath information and other manufacturing process data to be defined, transferred, and reused. A unique system of engineering notebooks allows anyone to capture important workflows, embed them with designs for downstream use, and carefully control necessary variables and parameters. This increases team collaboration, retains design intent, and ensures best practices are maintained.